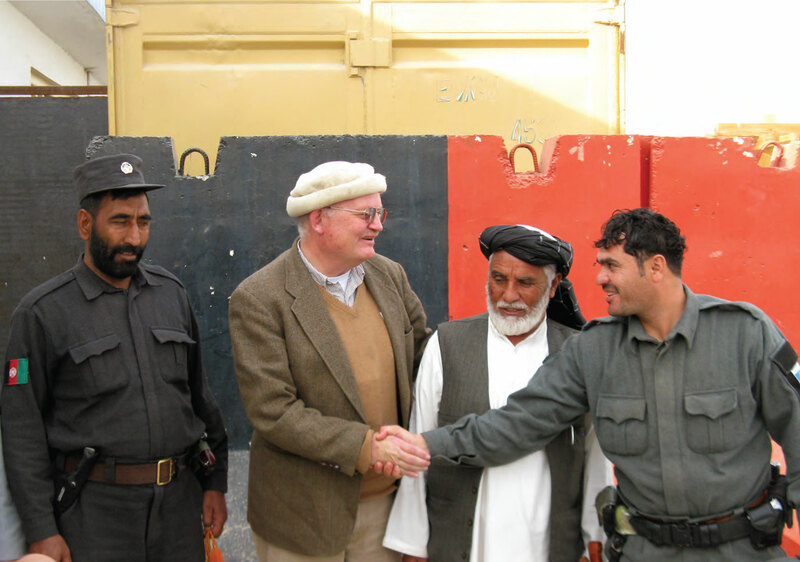 Ambassador Jonathan Addleton, second from left, meets with the district governor, second from right, and security officials in Panjwai district, west of Kandahar city, in fall 2012. Panjwai was once considered among the most violent districts in Afghanistan. Dissent is never easy. Respectful of the chain of command, I ordinarily accept decisions made by those above me and then move on. However, there are occasions when this approach is tested to the limit—and beyond. Once in my 30-year Foreign Service career, that resulted in a dissent cable. It happened last year, following the attempt by the Pakistan Taliban on the life of Malala Yousafzai, the Pashtun adolescent from Pakistan’s Swat valley who championed female education. Malala of Swat was named by her forward-looking father after Malala of Maiwand, a 19th-century Afghan heroine of whom folk songs are sung, stories are written and schools are named. At the height of battle against British forces in 1880, she had ripped off her veil, waved it like a flag and rallied the Afghan troops: the result was a famous victory during what the British refer to as the Second Afghan War. The heroine died shortly afterward, and the shrine constructed in her memory is visited to this day. The courage of both Malalas resonates for obvious reasons, providing an important example of bravery and outspokenness across two countries that are often at odds, yet face similar challenges. In Kandahar, where I was then undertaking the hardest assignment of my life, outreach was difficult. Yet this was a story that might help facilitate it. My reflection on the two Malalas’ bravery and continued relevance almost wrote itself, and would have provided an important point of conversation. But the story never appeared in the local Pashto press, apparently because of concerns that such commentary might inadvertently undermine Malala’s credibility in the face of conspiracy theories already emerging in Pakistan, that the United States was somehow behind the attack. Several months later, Secretary of State John F. Kerry addressed embassy staff in Afghanistan via video conference. In his remarks, Kerry emphasized candor and outreach as two essential aspects of our service. Using the Malala example as a starting point, my dissent cable provided a platform for broader reflection on how we as a Foreign Service could do better. Like many officers, I have been frustrated over the years at the complicated and uncertain clearance process, which all too often stifles or discourages outreach. At times, the clearance process itself seems more like a capricious obstacle course than a catalyst for effective public diplomacy. Drawing on these frustrations, I used the dissent cable to highlight several areas of special concern. First, our clearance processes are too cumbersome. While serving in Mongolia the previous year, it was disappointing to discover that it took no fewer than 32 signatures to clear an innocuous, book-length manuscript that was finally published by Hong Kong University Press. Something is seriously amiss when it takes longer to clear a document than it does to write or translate it. The best public diplomacy often takes place at a purely local level—and it is precisely this point that needs to figure more prominently in both the clearance process and in our approach to outreach. Third, we are too reticent in taking on extreme narratives directly, including radical Islamist ones. The fact that we don’t publish meaningful articles in the local press because of misplaced concerns about conspiracy theories elsewhere suggests we have prematurely surrendered on the information front. Somehow we need to become more confident about the ideals and foundations on which our own society is built, to challenge more directly those who are committed to violently destroying them. My intent in writing the dissent cable on Malala in February 2013 was to help precipitate an internal discussion on important public affairs matters and to make the case for an approach that is more nimble, less bureaucratic and gives greater authority to the field. The mandatory official response to the original dissent cable suggested that the timing had not been right for an article on Malala, given the sensitivities involved and the possibly counterproductive consequences of having a U.S. official publicly comment on a case that was already being widely discussed in Pakistan. At the same time, it acknowledged that the department could perhaps have been better attuned to the merits of publishing commentary like this in the more localized context of Kandahar. From my perspective, the “missed opportunity” did, indeed, stem from a failure to recognize that the best public diplomacy often takes place at a purely local level—and it is precisely this point that needs to figure more prominently in both the clearance process and in our approach to outreach. Hopefully this year’s Christian A. Herter Award will give further impetus and visibility to this important discussion. Finally, it is my sincere hope that this award will bring greater recognition to those who serve or have served in extraordinarily difficult and even dangerous circumstances, including most especially colleagues in Kandahar and across southern Afghanistan. We, too, live in serious, even momentous, times. Hopefully, our entire Foreign Service can directly confront the challenges that we face in ways that are truly serious and, ultimately, make a lasting difference. A career Foreign Service officer, Ambassador Jonathan Addleton is the recipient of AFSA’s 2014 Herter Award for constructive dissent. He is currently regional USAID mission director for the Central Asian Republics, based in Almaty, Kazakhstan. He previously served as U.S. ambassador to Mongolia; senior civilian representative for southern Afghanistan in Kandahar; development counselor at the U.S. Mission to the European Union in Brussels, Belgium; acting USAID deputy assistant administrator for legislative and public affairs in Washington, D.C.; mission director in Pakistan and Cambodia; and a program officer in Jordan, South Africa and Yemen. Prior to joining the Foreign Service in March 1984, he worked briefly at the World Bank, the Macon Telegraph and the Carnegie Endowment for International Peace.